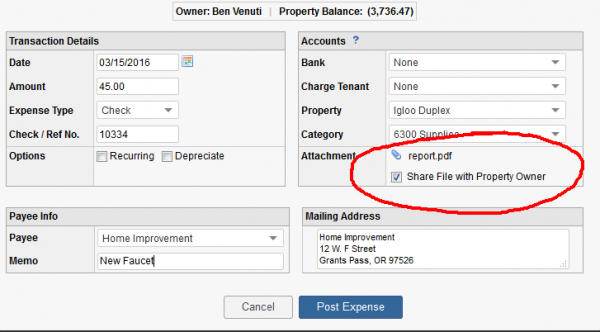 Rentec features the ability to share file attachments on transactions with property owners. With this attachment sharing feature, you will be able to actively communicate with your property owners about the status and activities related their properties. The system has long had the ability for property managers to attach scanned receipts, photos of repair work or documents from vendors to a transaction. Now, your property owners can be given the option to view these attachments as well. When one of your property owners logs into their Owner Portal to view the Statements or Property Statements, the attachment preview link will appear as a small blue paperclip to the left of the transaction item. Clicking the paperclip will bring up the attachment in a preview window with the option to download it. Owners can view attached files in a pop-up window by clicking on the blue paperclip found in the Owner Portal. This process also applies to split transactions, in which one attached file is associated with multiple transactions. 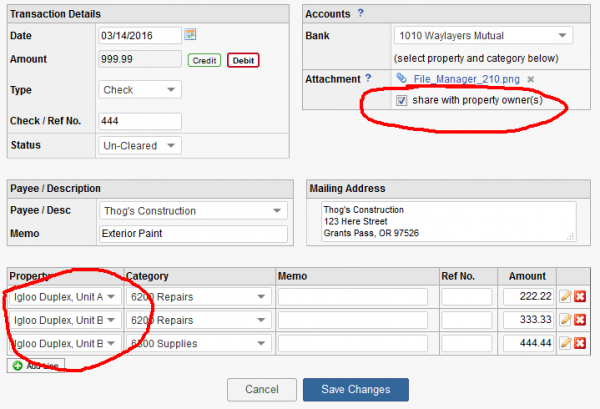 On the split transactions page, selection of properties determines whether the file can be shared. If at least one of the properties has a designated owner, then the sharing option becomes visible.